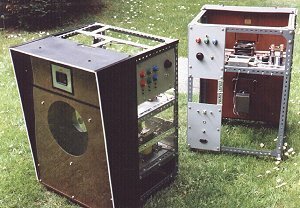 This is another technical hobby - but one with a real difference! For nothing connected with it can be bought ready-made - everything has to be constructed from scratch. What are we talking about? 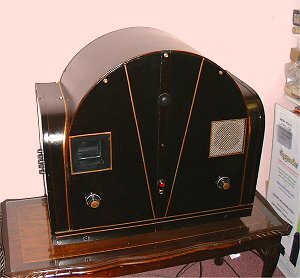 A form of television, generally using mechanical techniques, which reproduces the methods used to transmit images right at the very beginning of television research, back in the 1920s. Above we see my home-made 'Grosvenor' colour monitor. And (above) here's the colour camera to feed it... 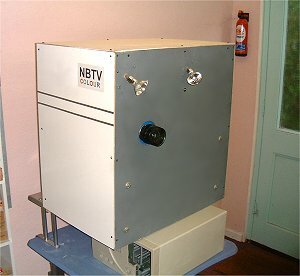 This sort of mechanical television apparatus uses an internal revolving disk punched with a spiral of holes to break up the image and scan it in an orderly sequence. This type of disk was invented as long ago as 1884 by a German called Paul Nipkow.